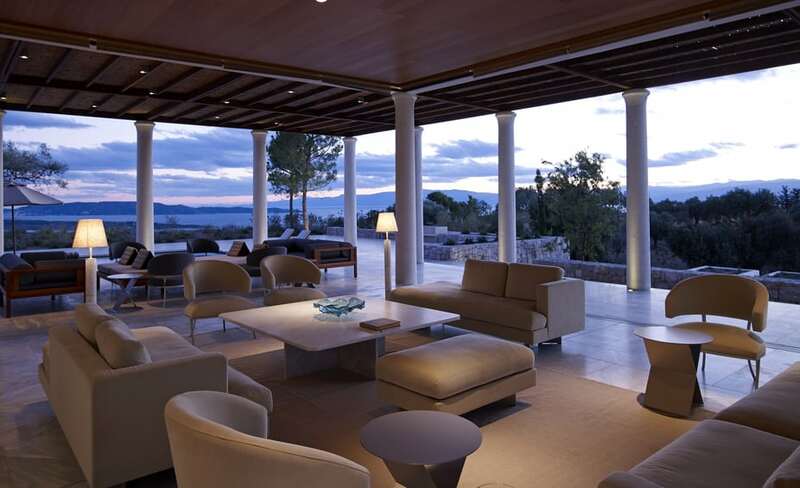 Experience Greece the way it used to be and the way it is now at this unique 6 Bedroom Luxury Villa Rental. 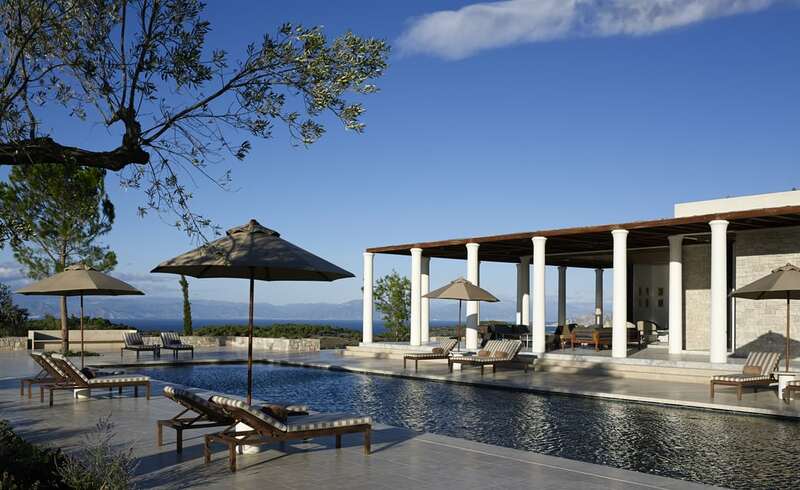 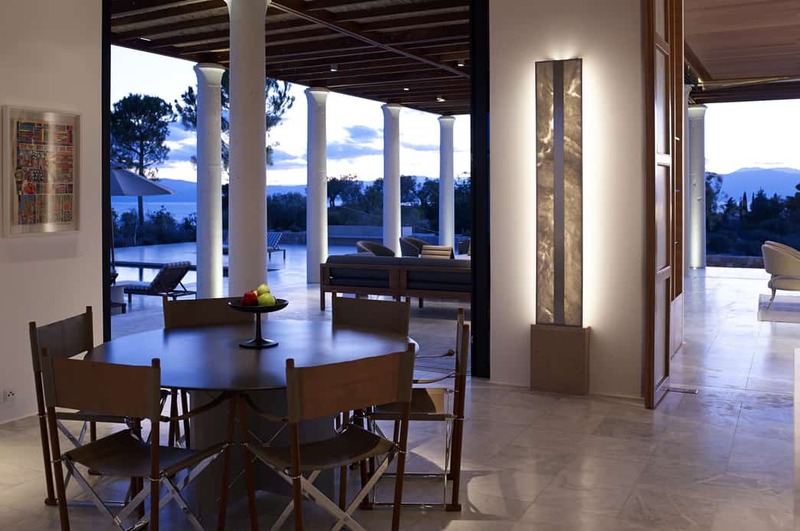 Set amid olive groves on a rise overlooking the Aegean Sea, Amanzoe is the perfect setting where both the ancient and modern sides of Greece culminate in an unforgettable experience. 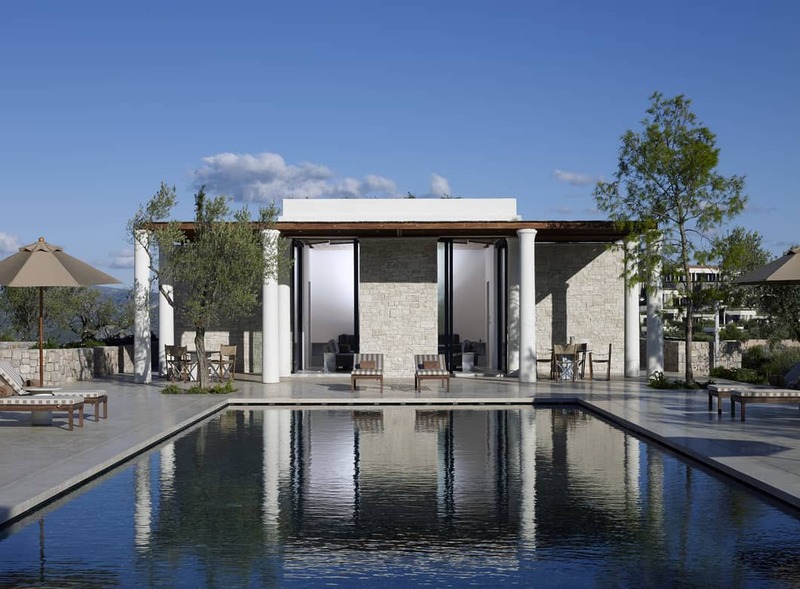 The six Bedroom Villa at Amanzoe features a Private, outdoor 20m (66ft) heated pool, four ensuite bedrooms, including a master bedroom, living-dining room, study/SPA room, fully equipped Kitchen, laundry, staff quarters, media center, garage or parking space, WI-FI, terrace with shaded area. 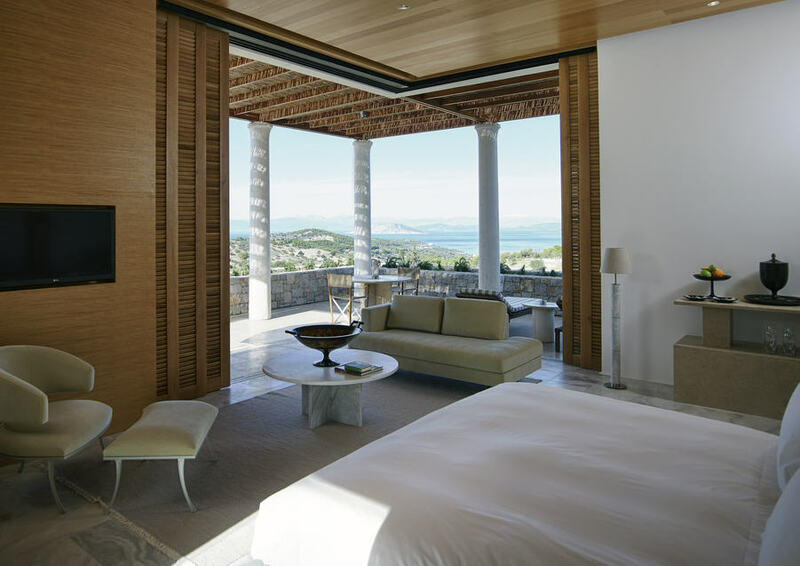 The six-bedroom suites all have king beds, en-suite bathrooms, air conditioning and Wi-Fi. 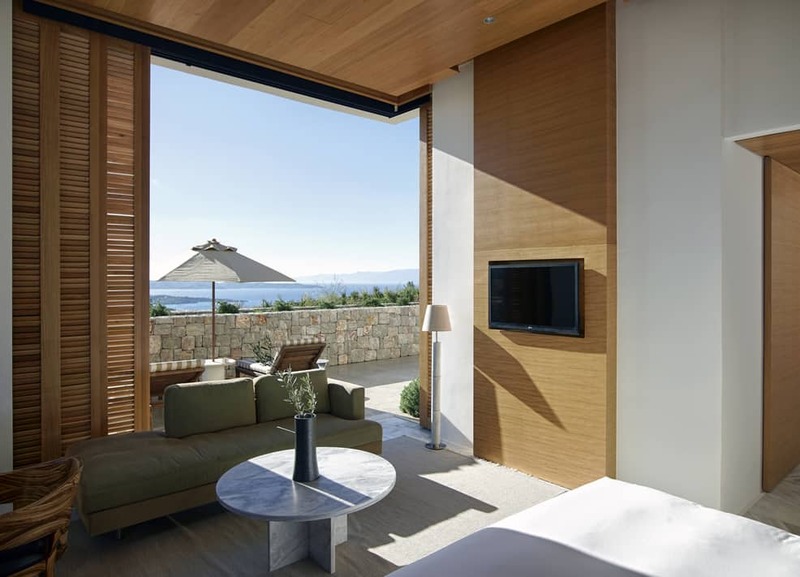 There are suites that boast views of the sea and open to a terrace or garden, so you can let the sea breeze going through while you sleep or wake up to the fresh air of the countryside. 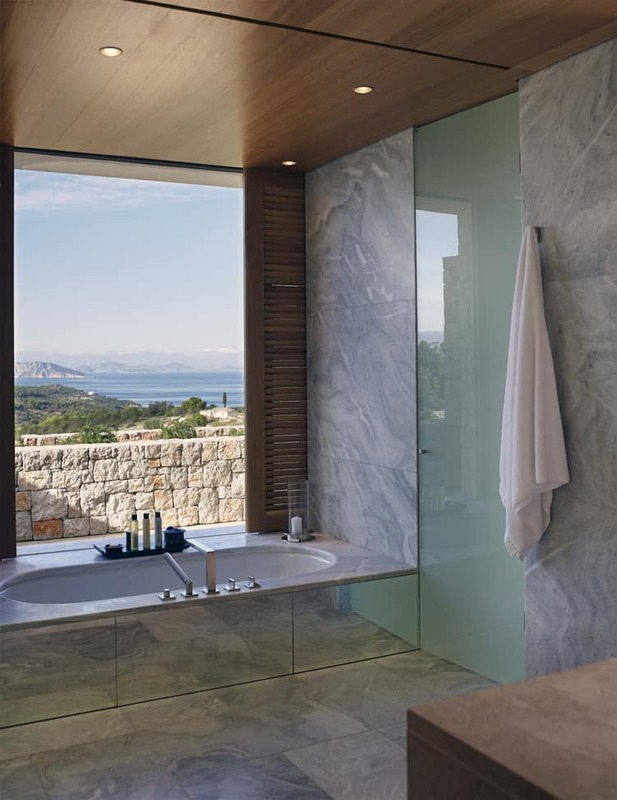 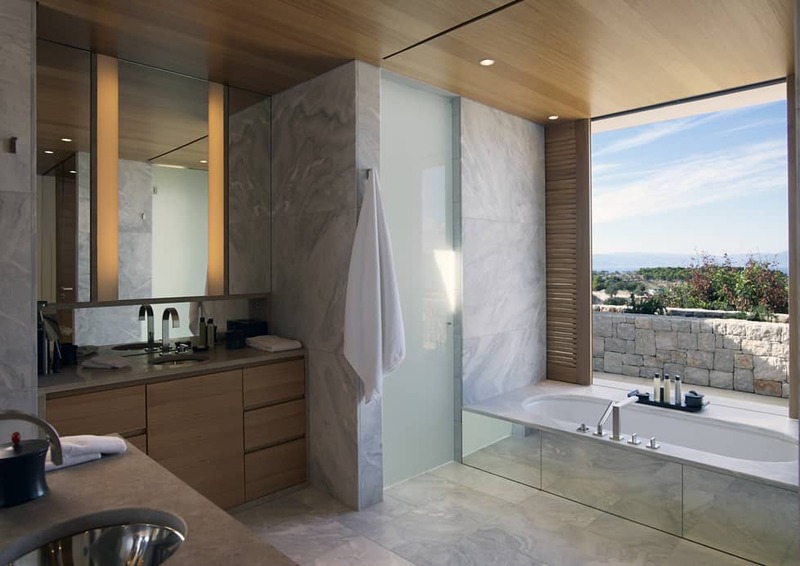 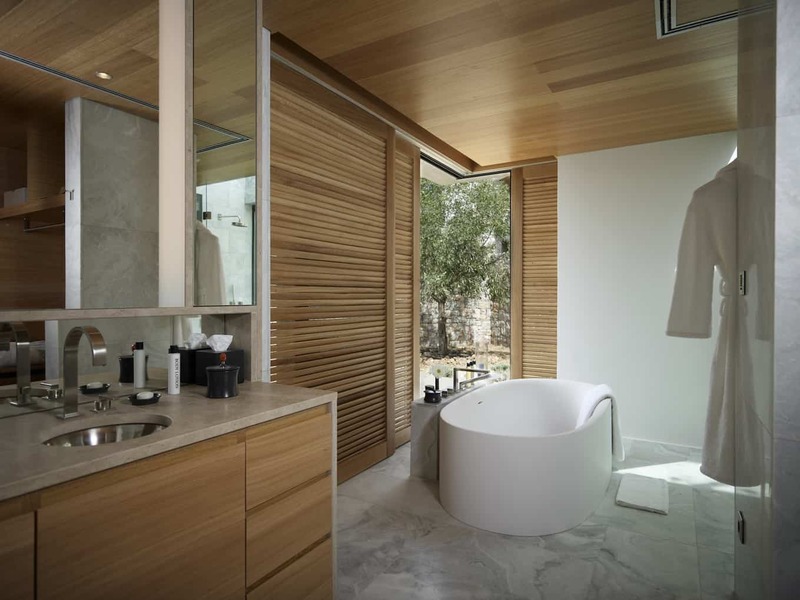 The bathrooms feature marble and wood with large windows that boast spectacular views. 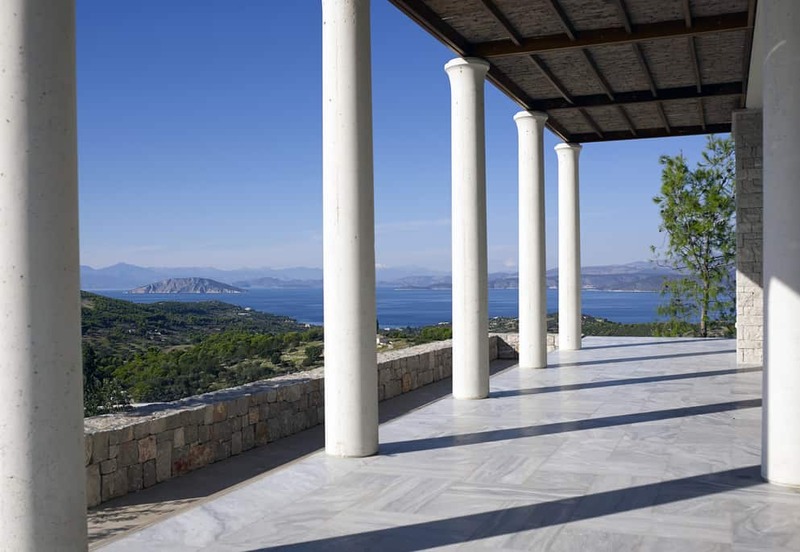 Each villa boasts spectacular views of the Aegean Sea and/or surrounding countryside. 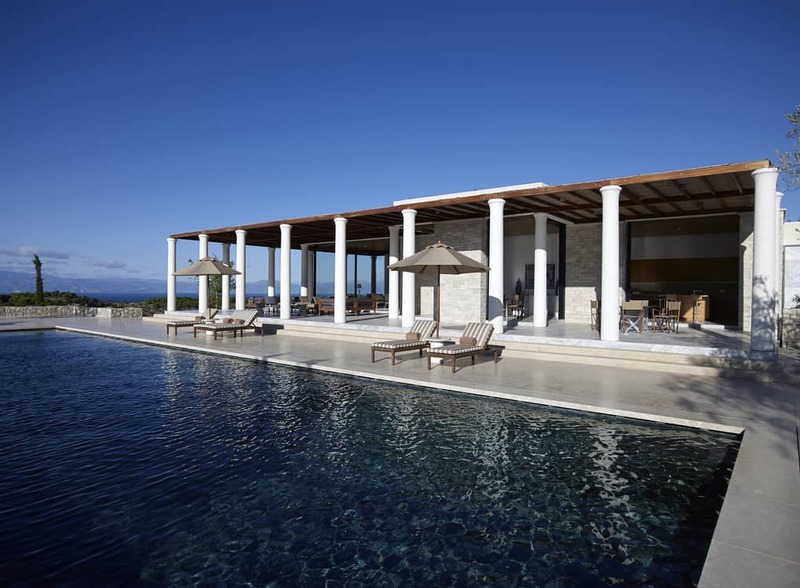 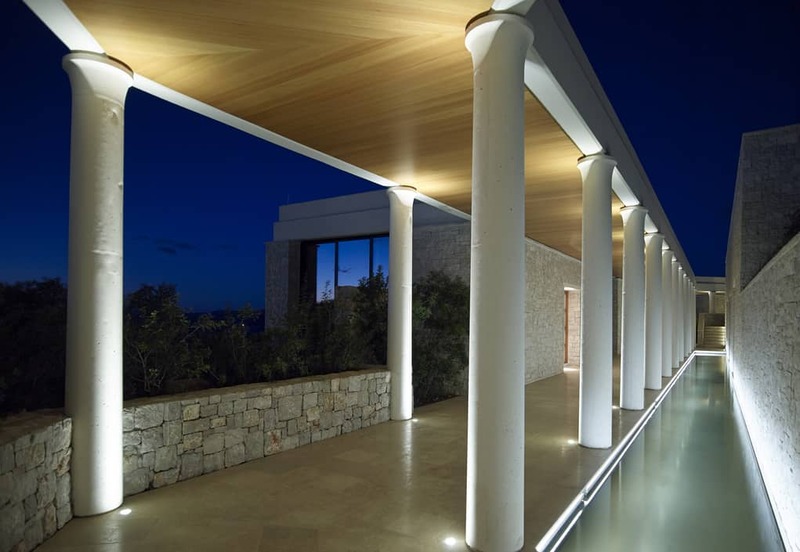 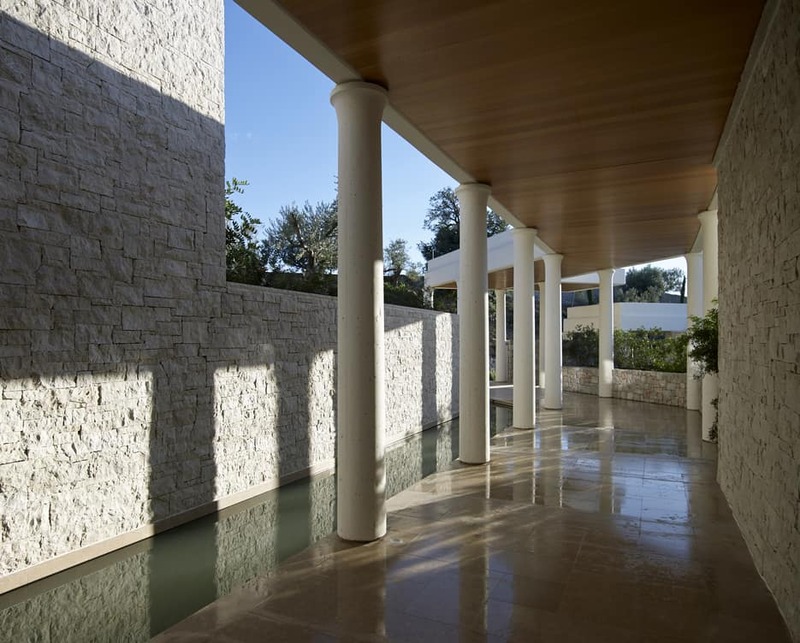 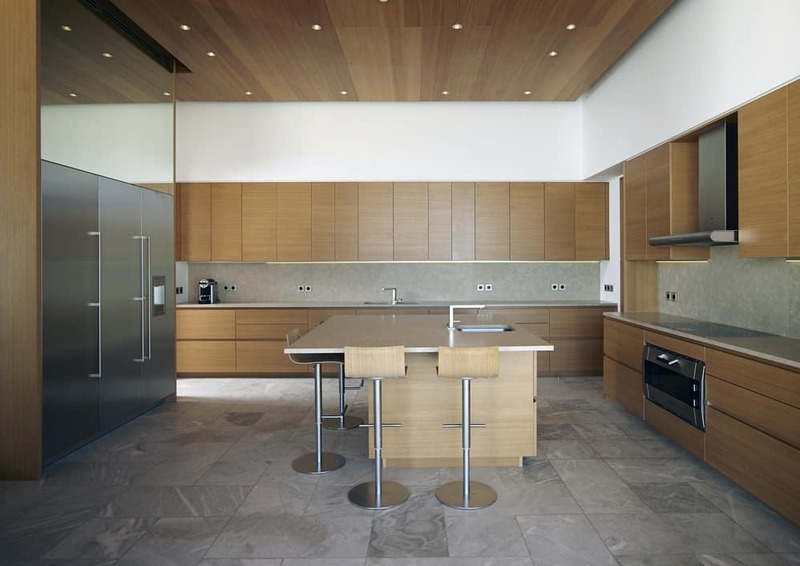 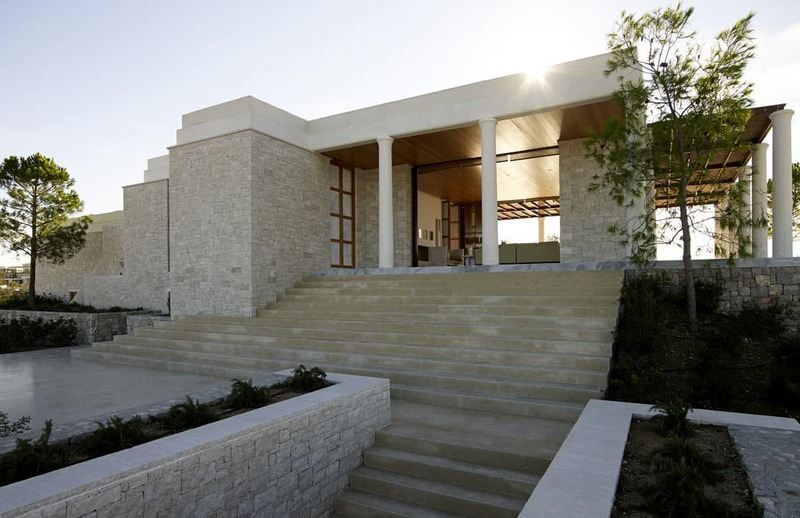 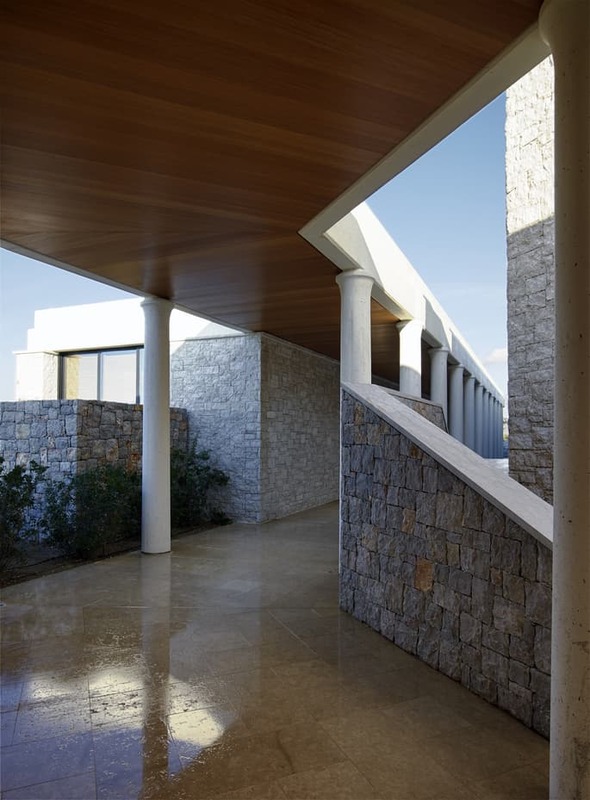 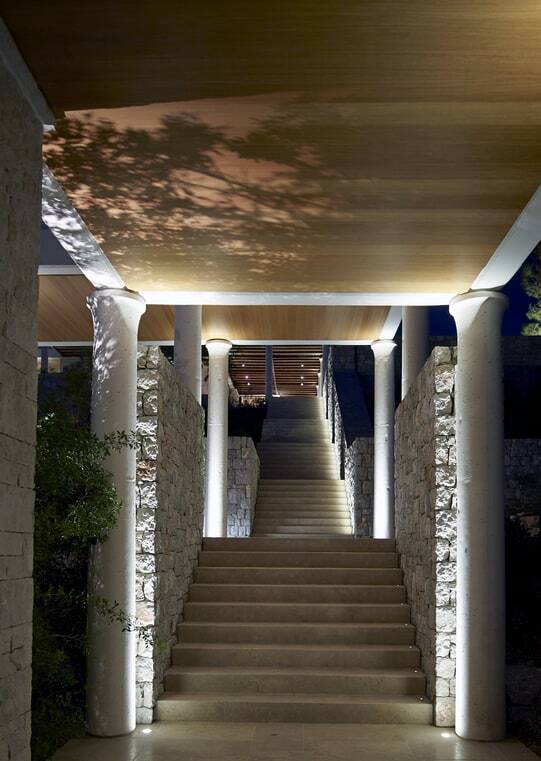 The villa’s terraces are lined with stately columns enrich with the fold-away glass walls and sleek furnishing. 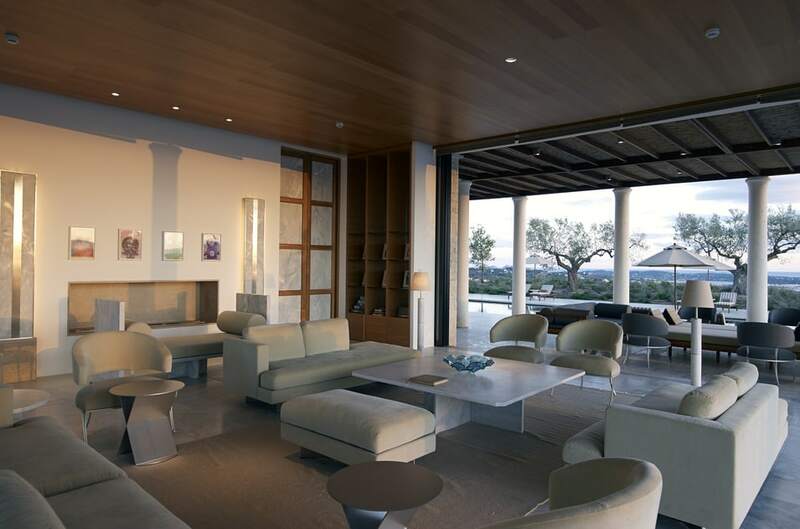 These villas feature polished marble tables, age-old material, squared-off sectionals in neutral tones and metal accent pieces add a bit of edge. 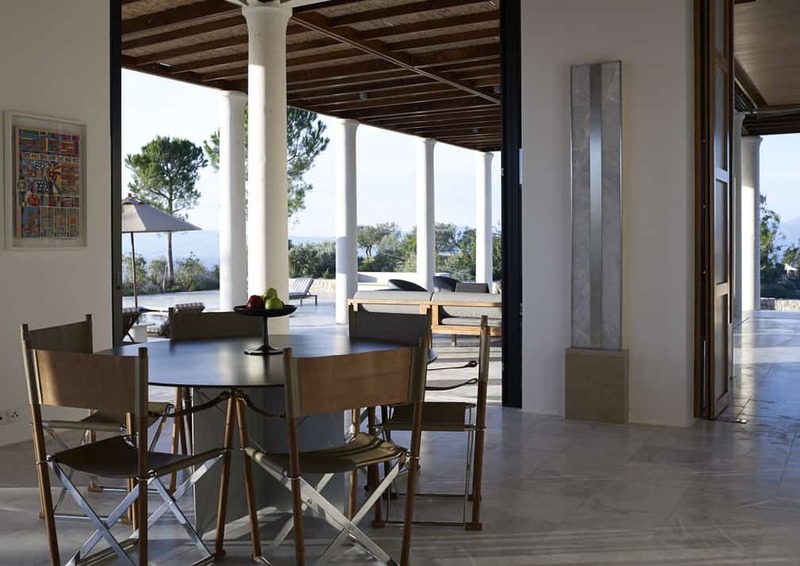 Daily breakfast, a dedicated chef and host are included in your stay, and guests have access to the beach club, complimentary shuttle to the beach club (about 6 km) tennis courts, yoga and Pilates studios and a gym. 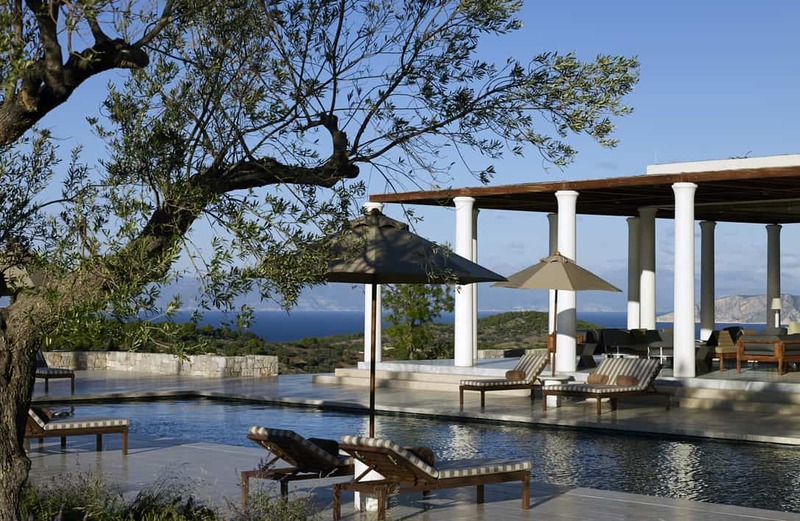 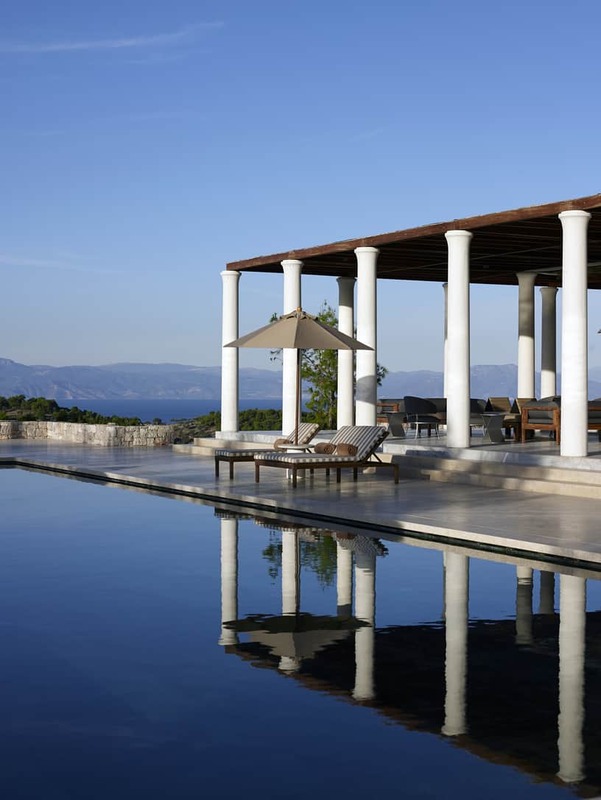 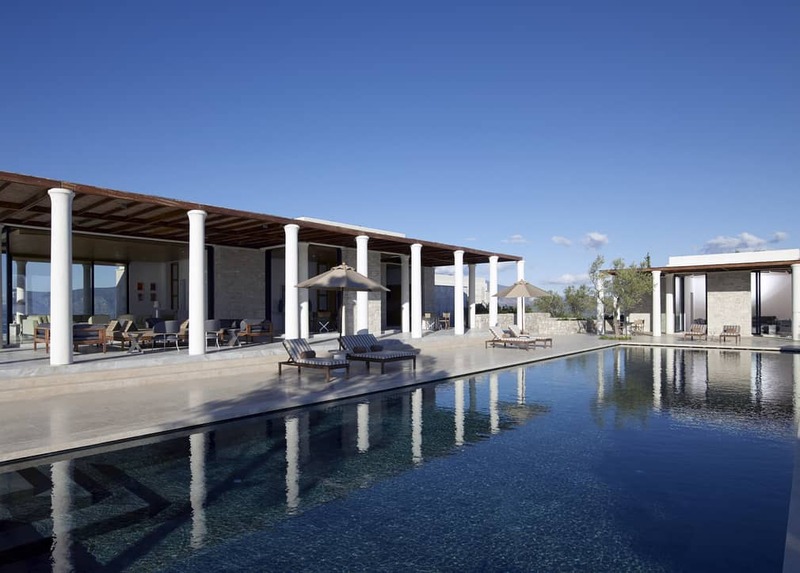 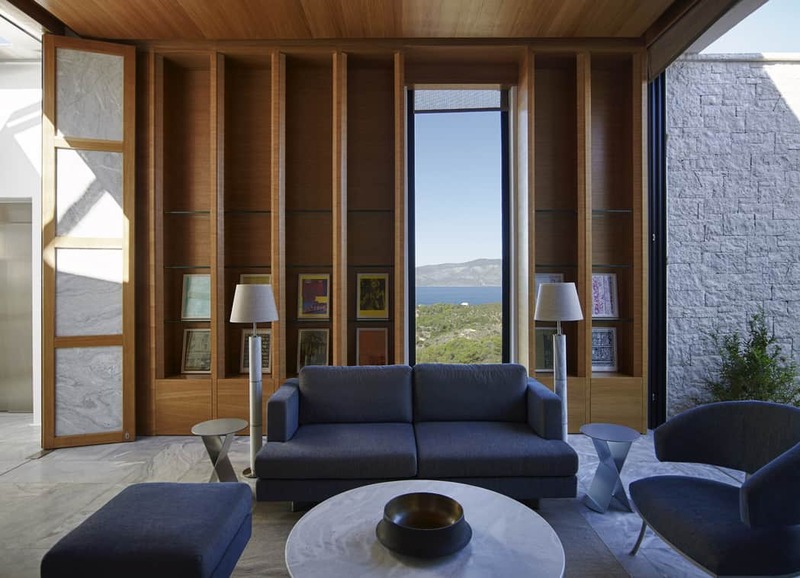 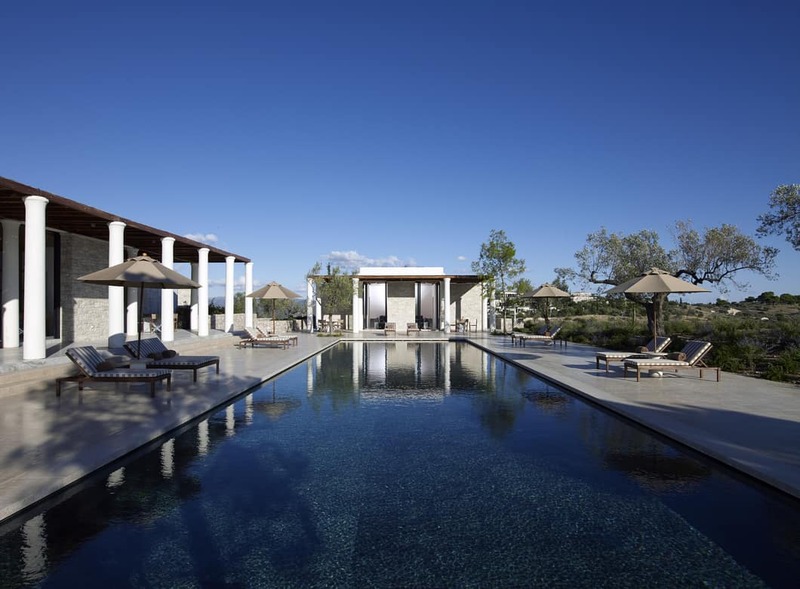 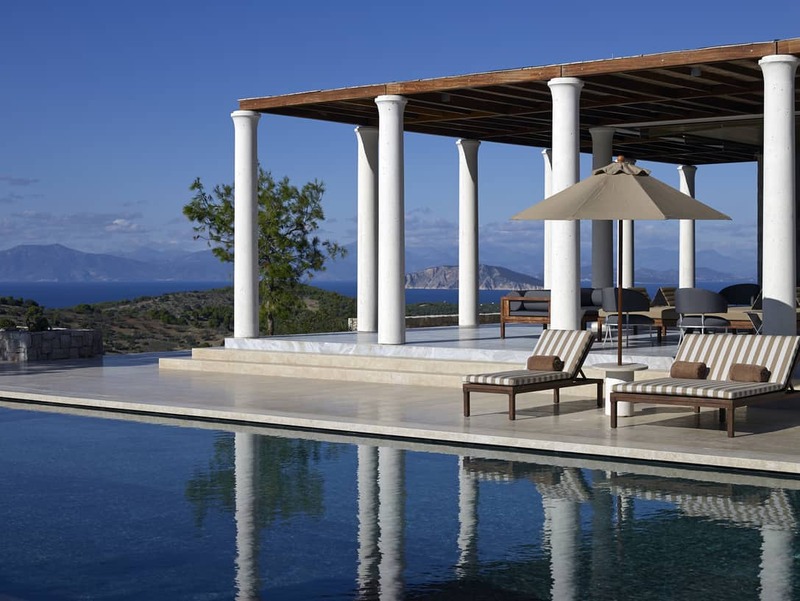 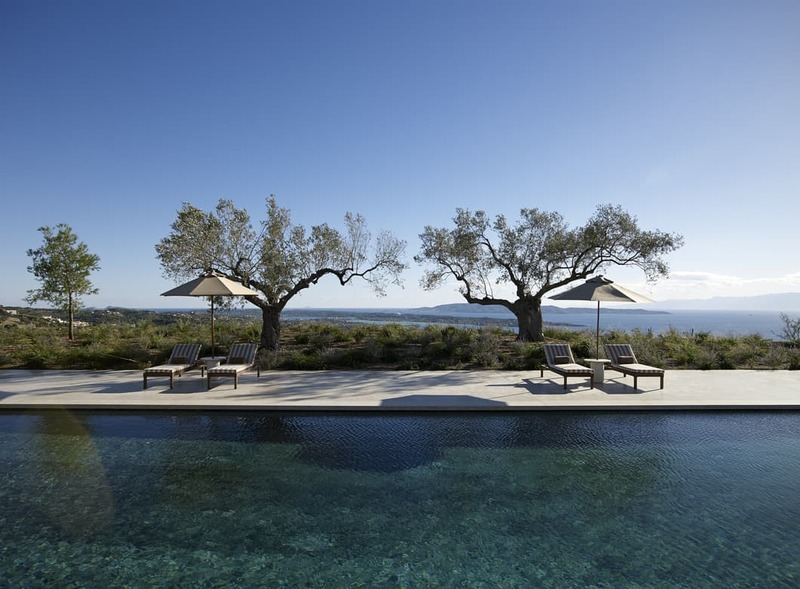 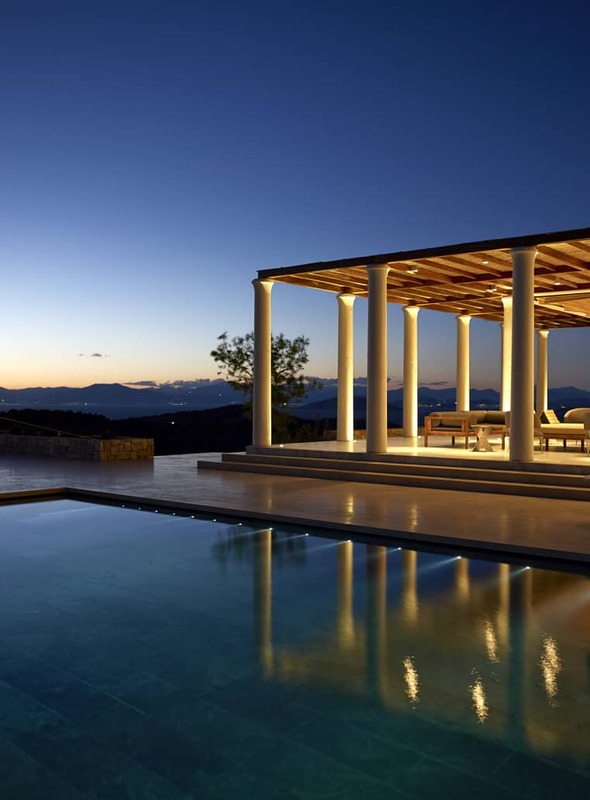 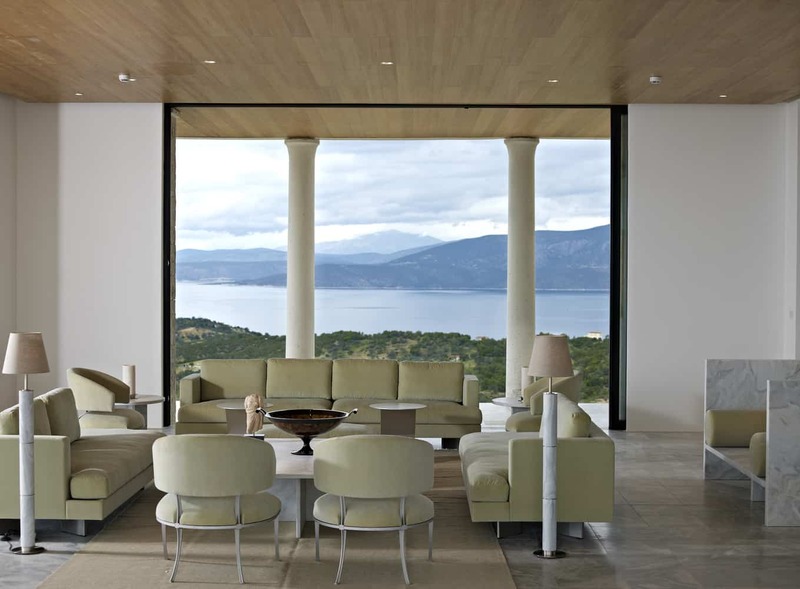 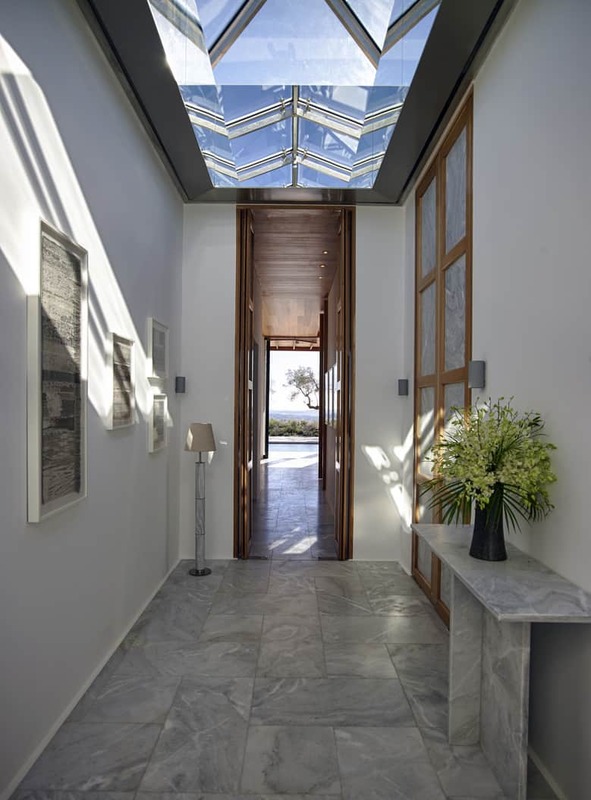 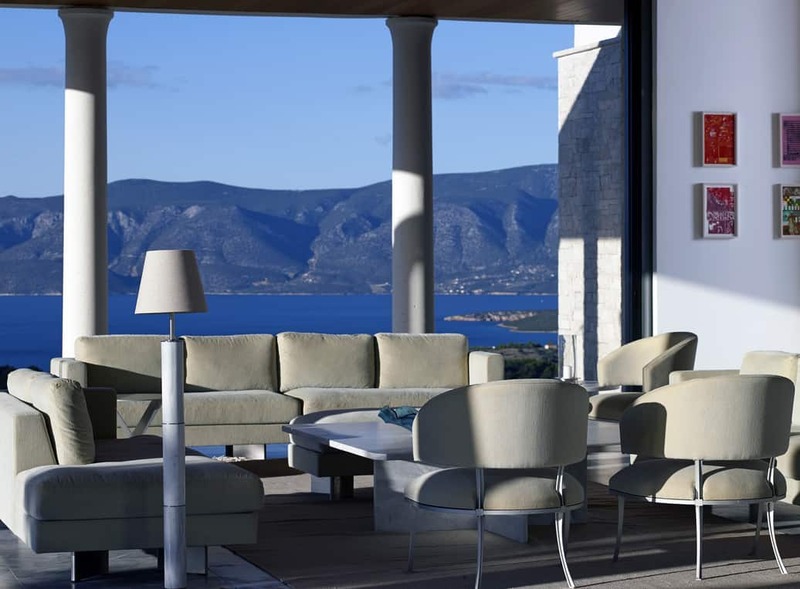 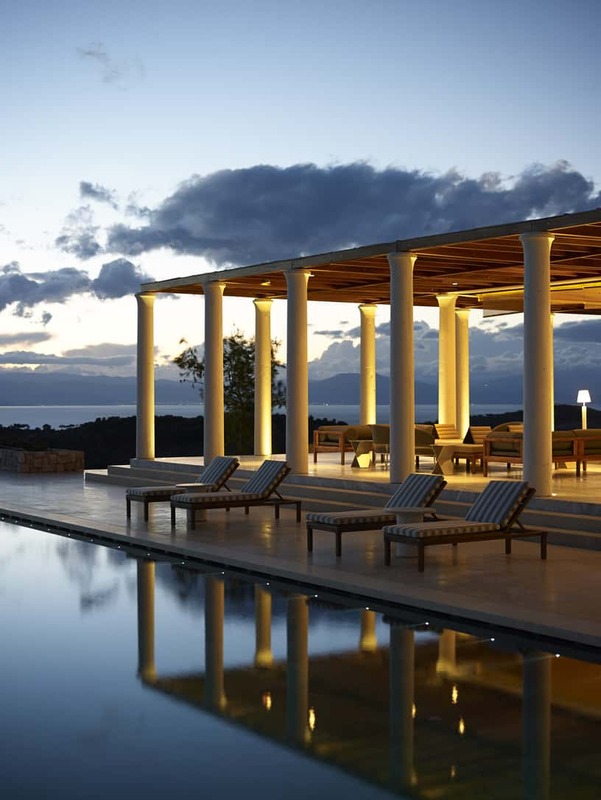 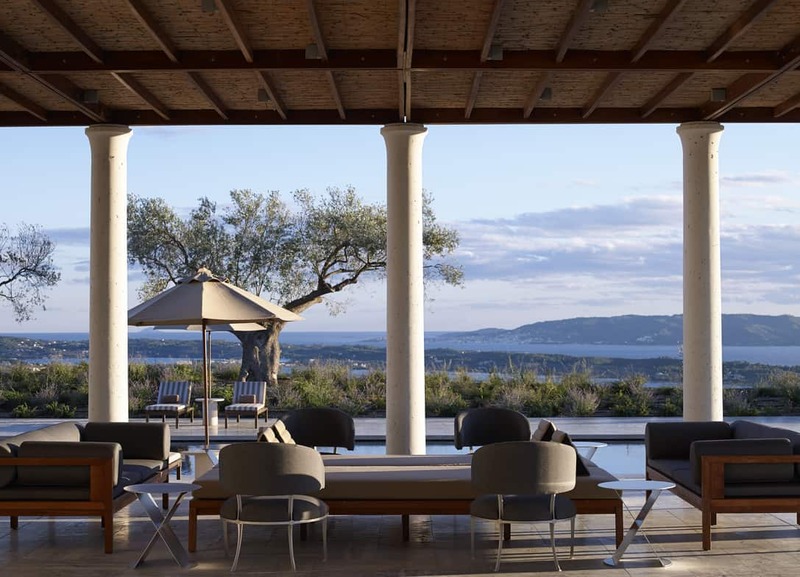 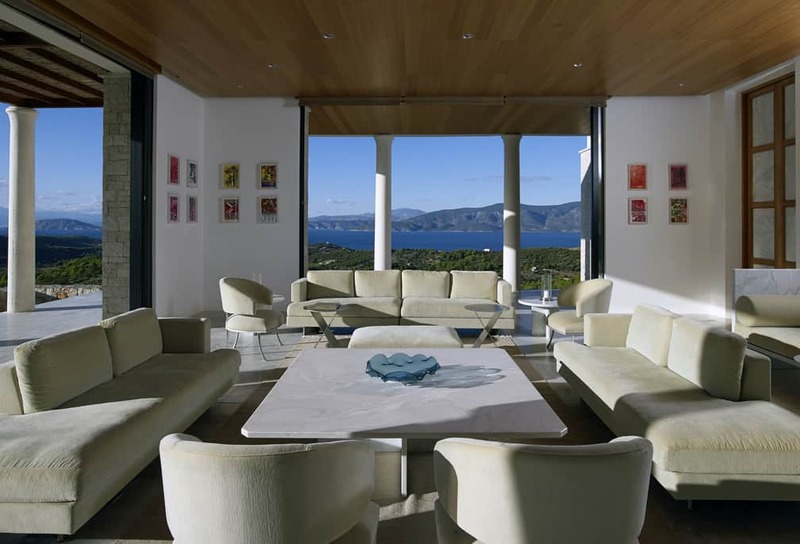 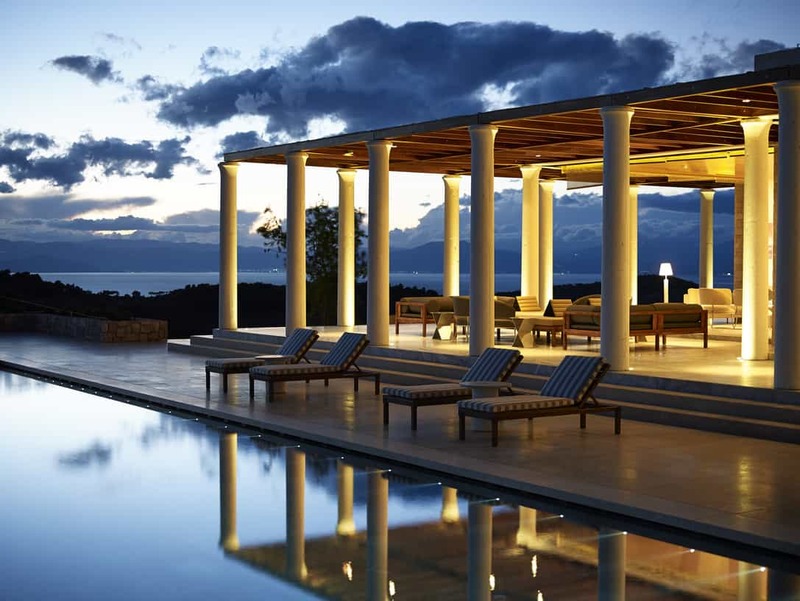 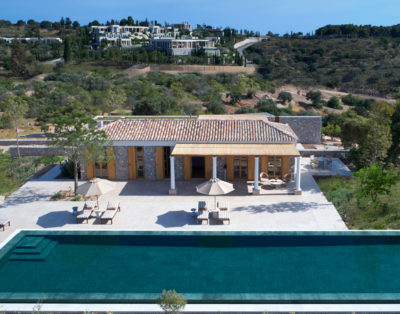 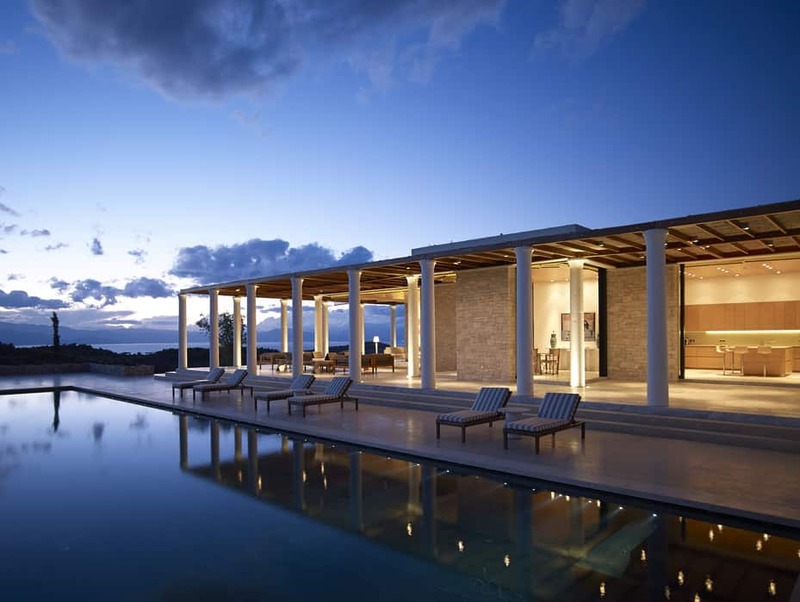 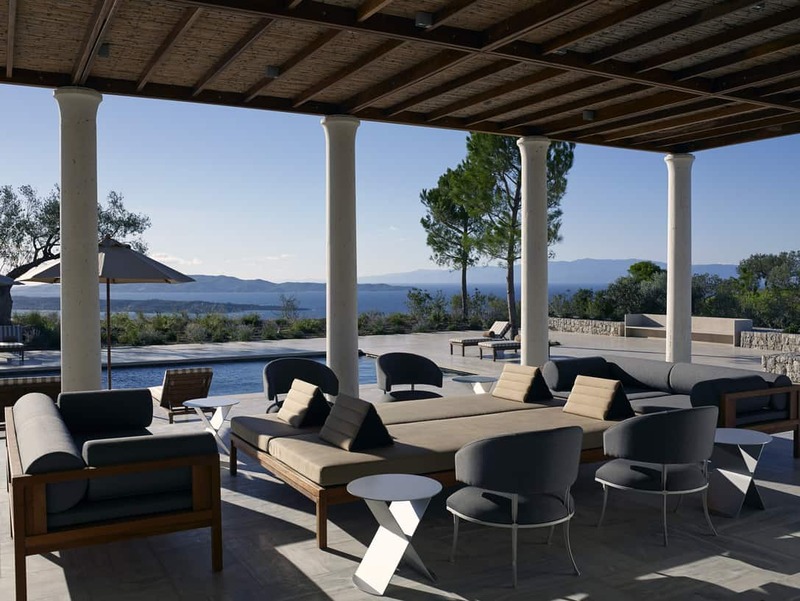 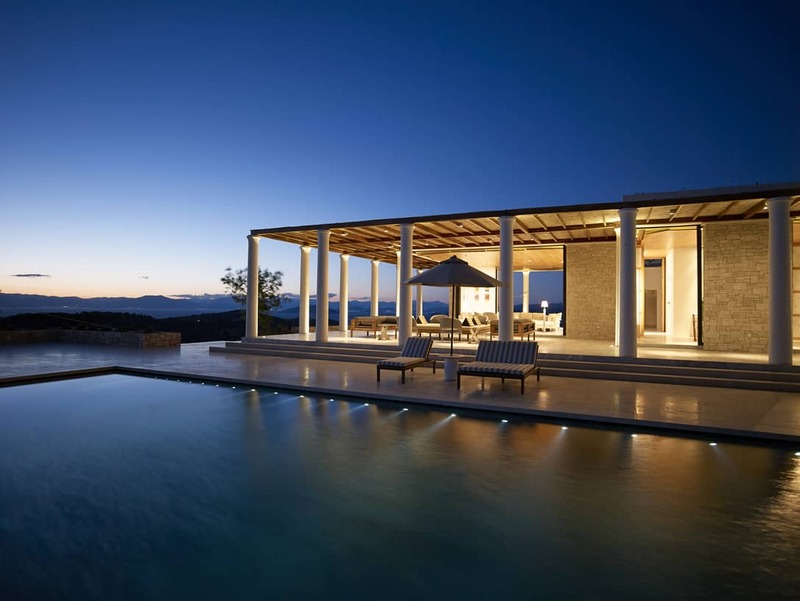 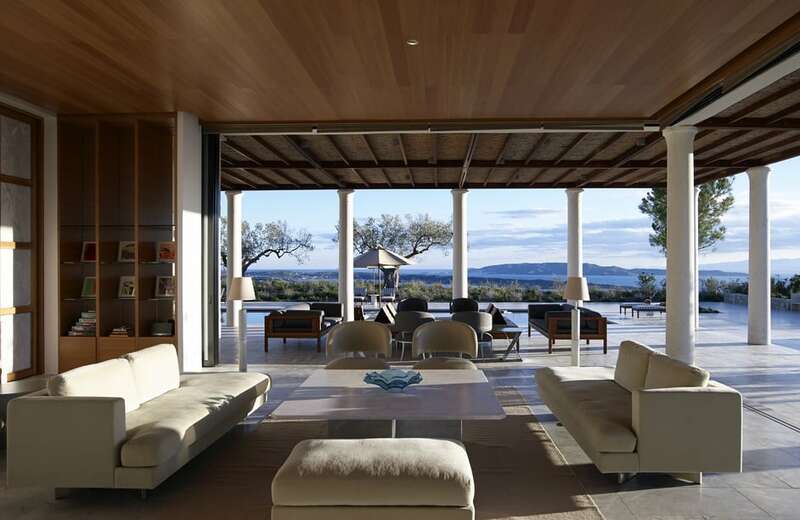 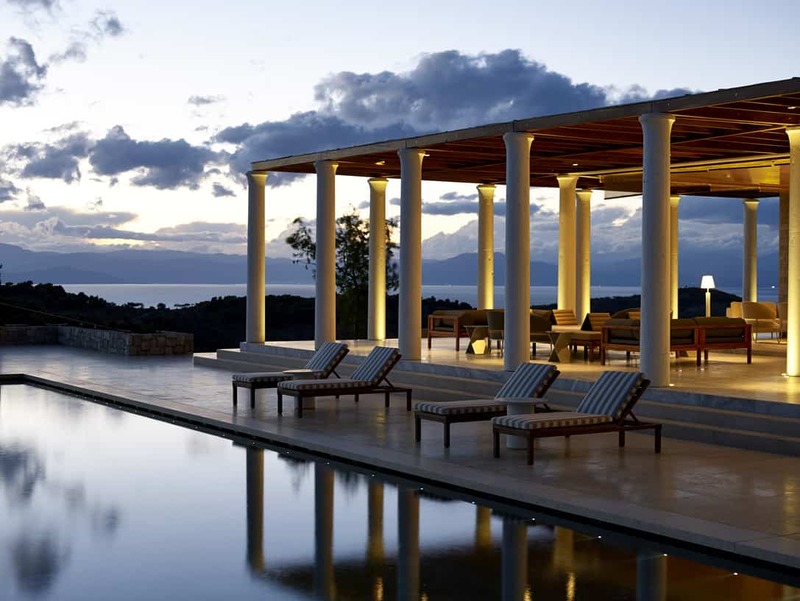 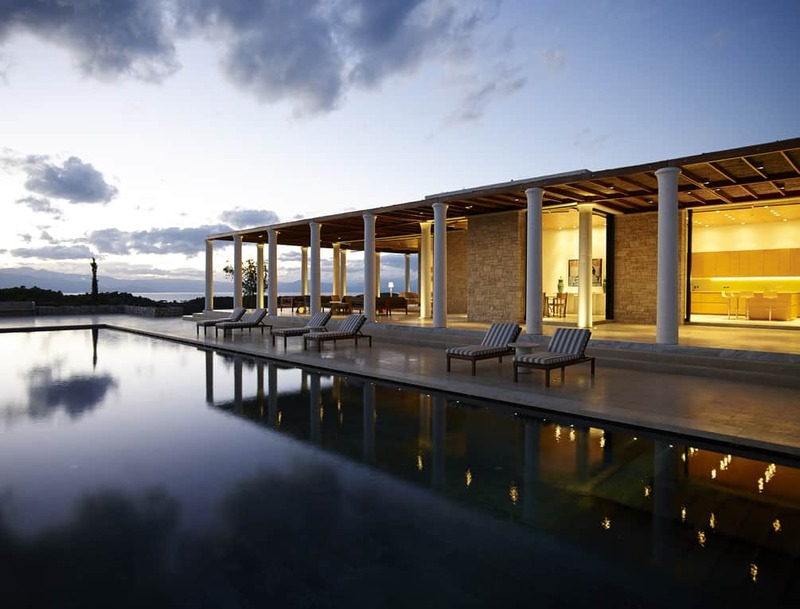 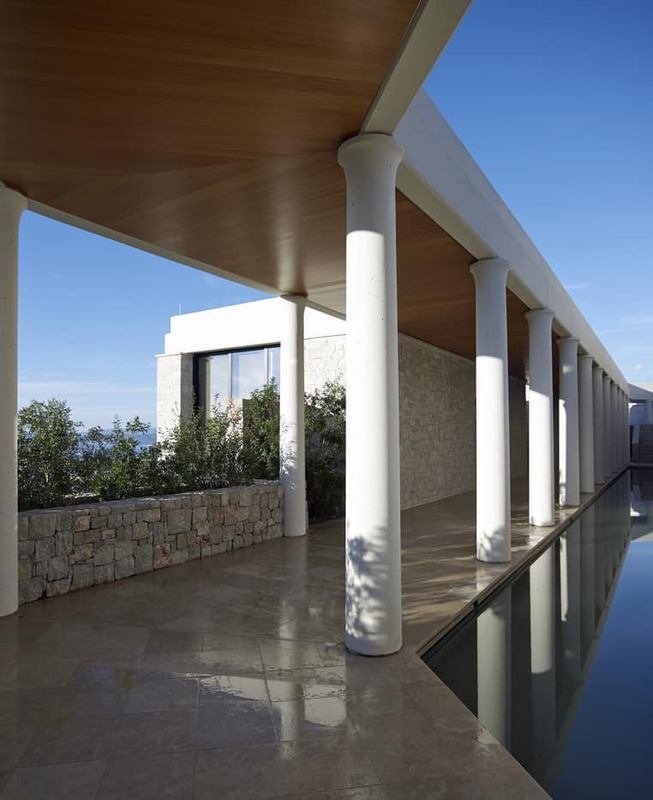 “It’s the best-kept secret,” said Sven Van den Broeck, the general manager of Amanzoe, an elite resort that opened in 2012 on a hilltop overlooking Porto Heli. 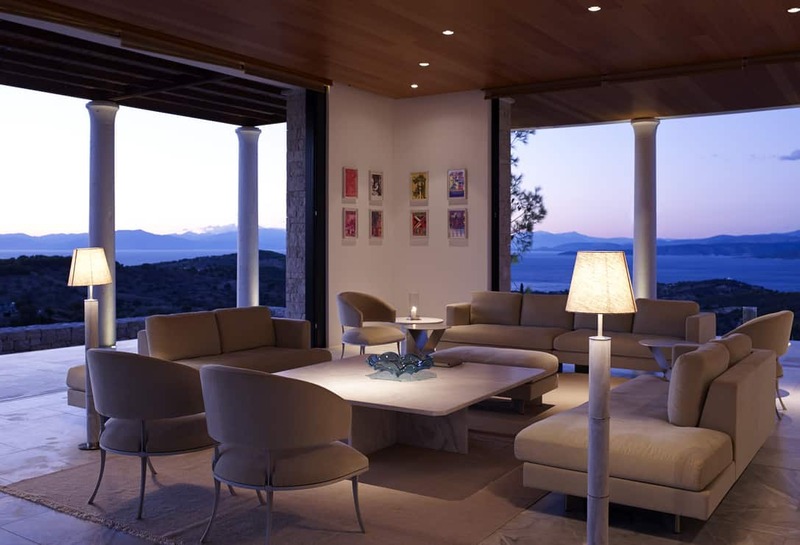 The area is chock-full of protected coves and bays on the crystal-clear waters of the Aegean. 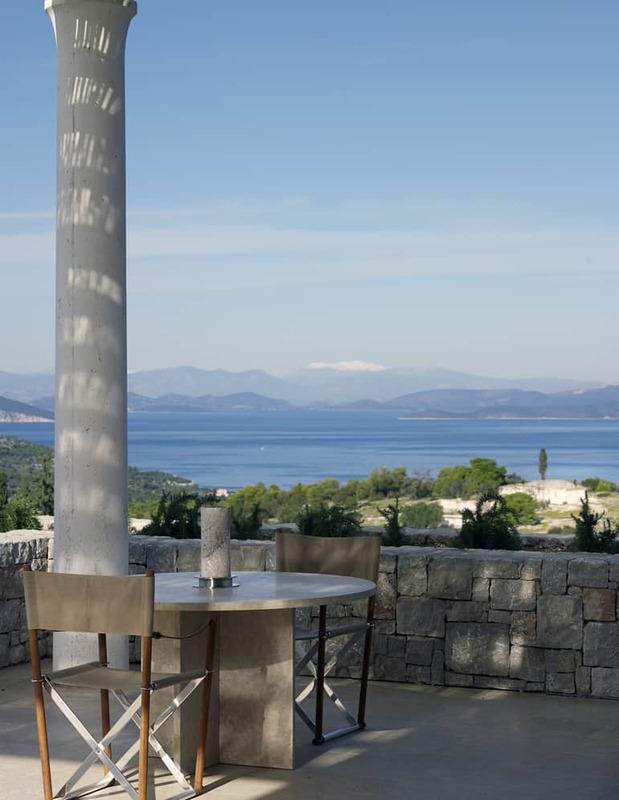 Known as the Saronic Gulf, the region has drawn well-heeled Greek families for decades; their properties preside regally over the seaside hilltops, nestled above the olive groves. 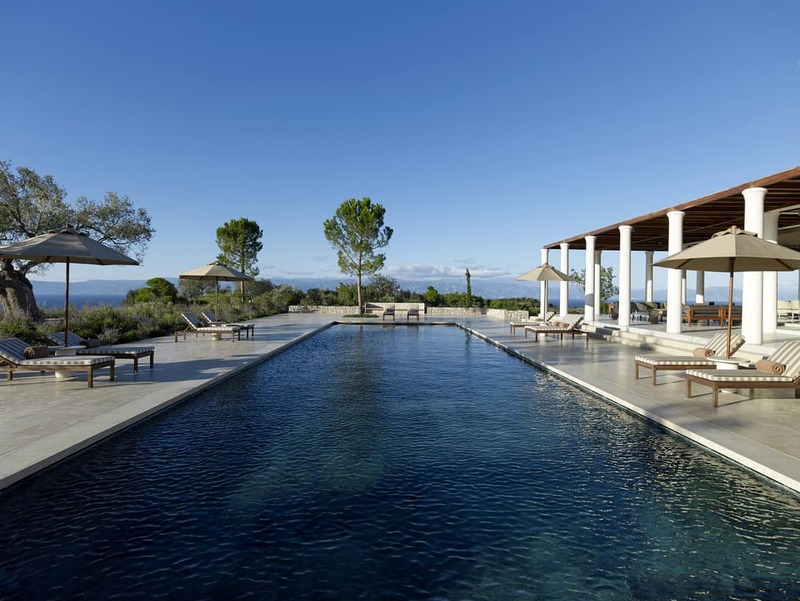 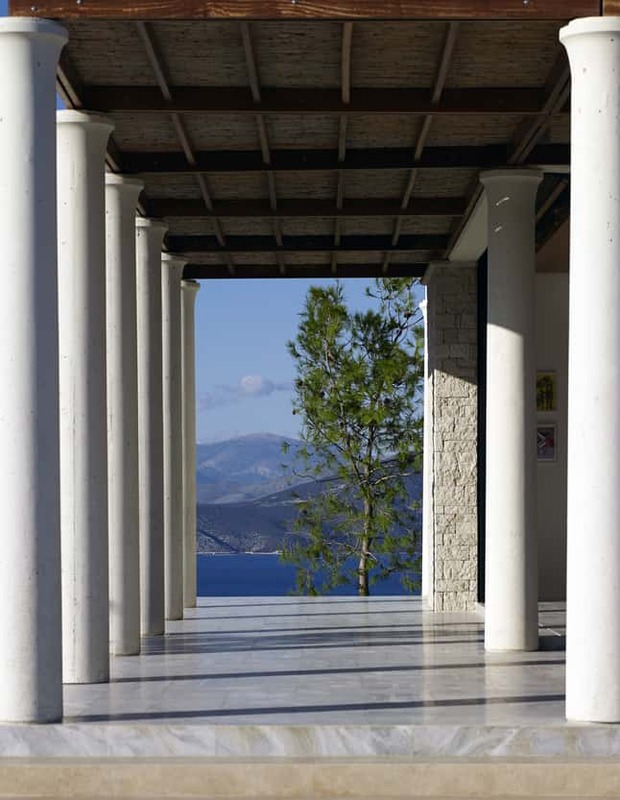 Amanzoe draws its name from the Sanskrit derived word for ‘peace’, ‘aman’, and ‘zoe’, the Greek word for ‘life’. 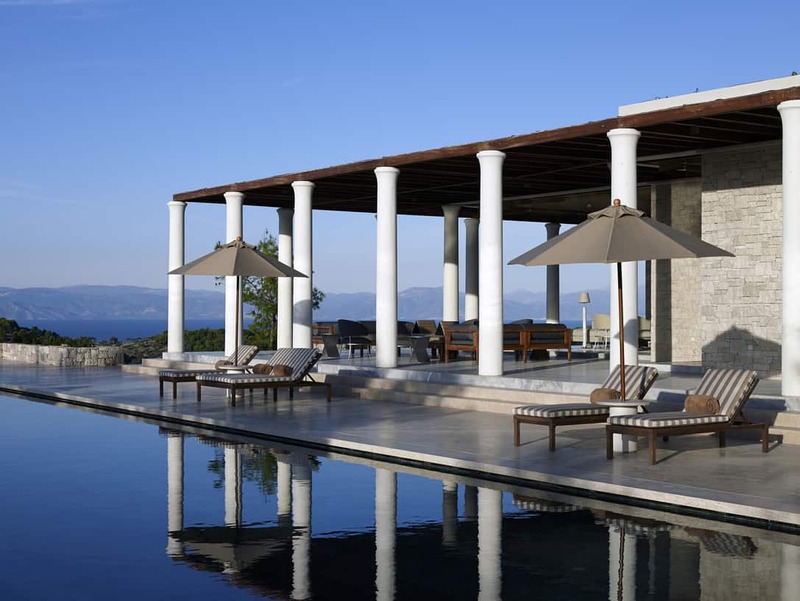 A Greek luxury resort that embraces Greece’s rich history and culture and a contemporary retreat. 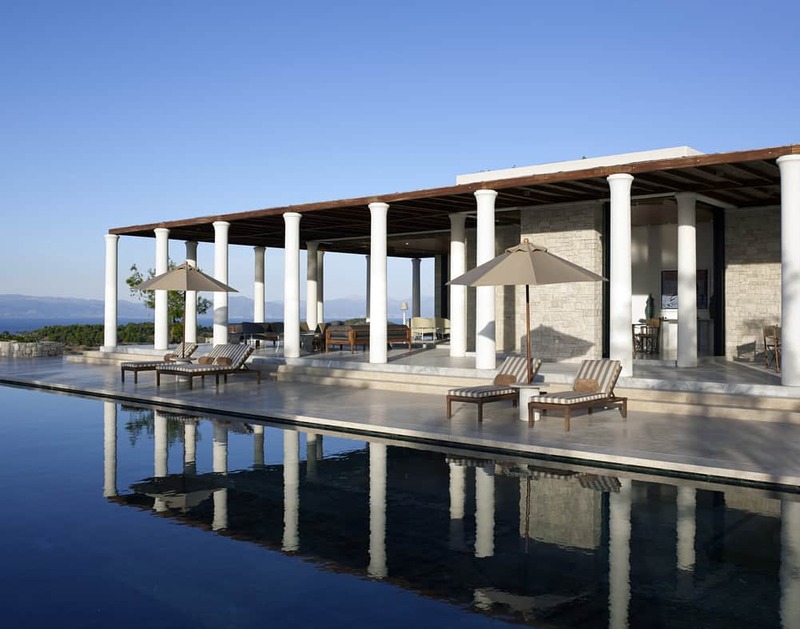 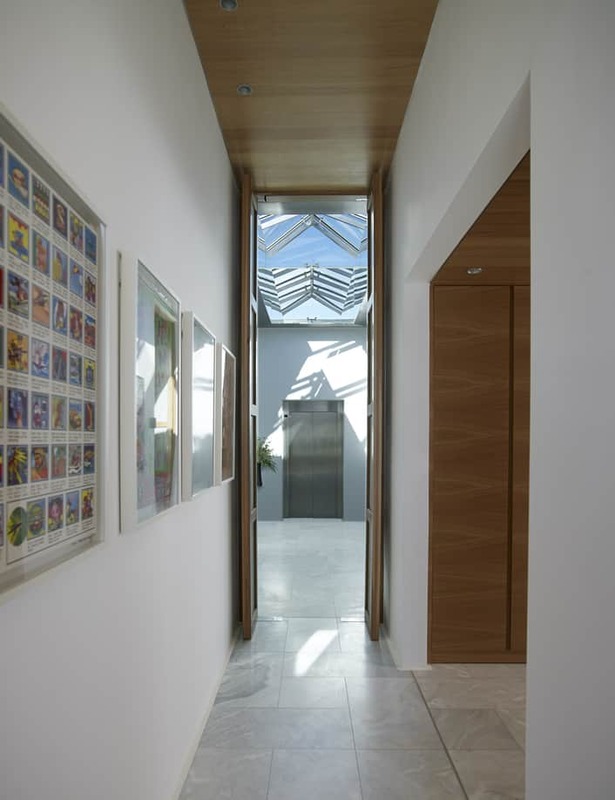 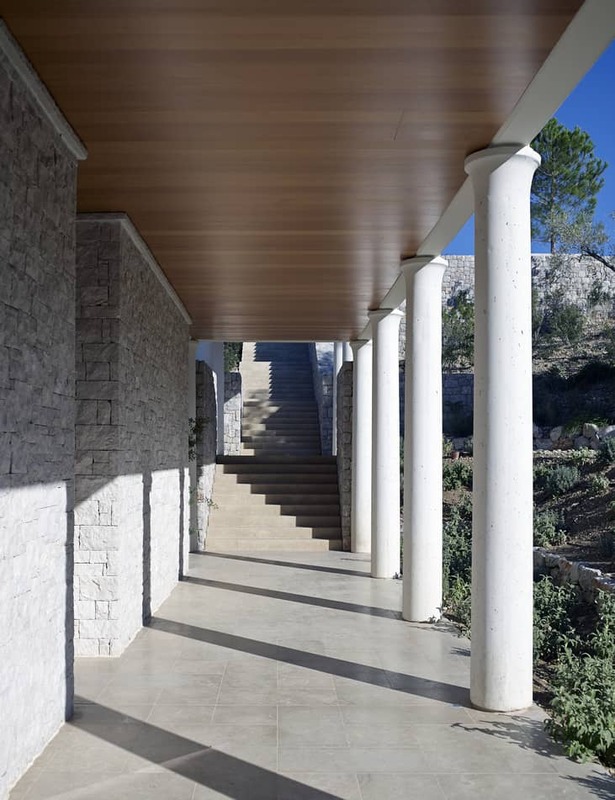 The architecture takes Greek columns, beamed ceilings, stone courtyards with a modern update. 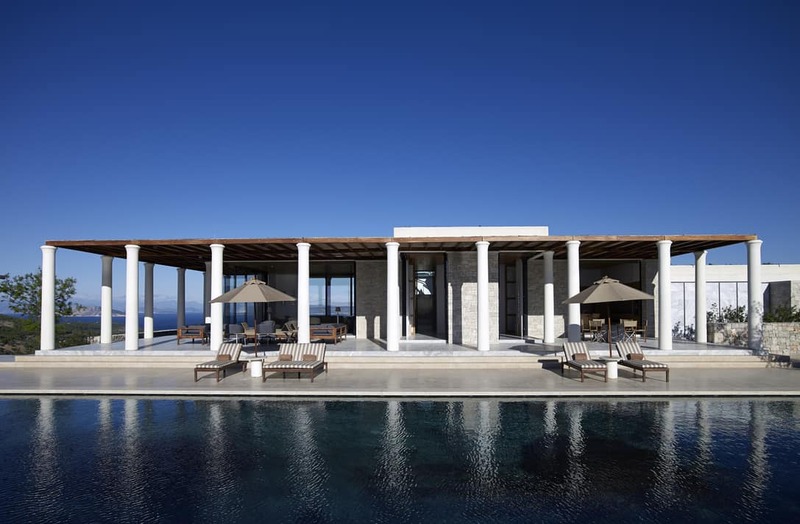 The villa’s terraces may be lined with stately columns, but the fold-away glass walls and sleek furnishings are a new spin. 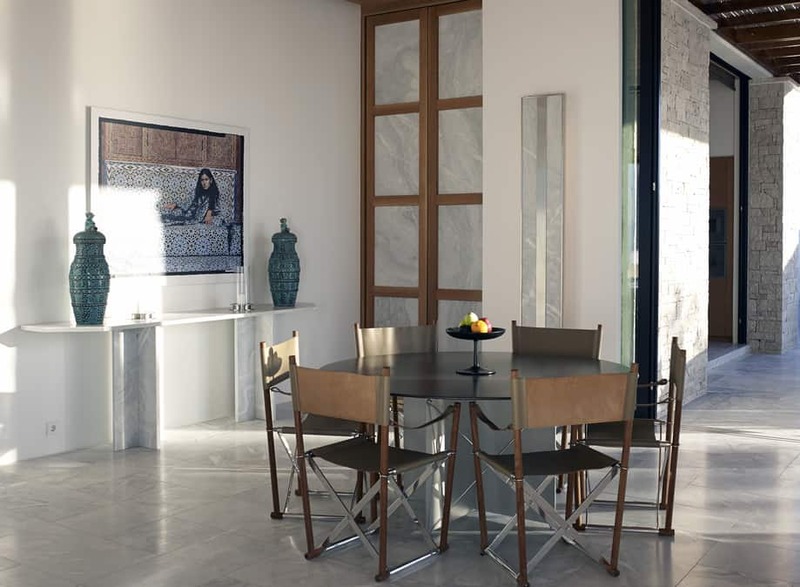 Squared-off sectionals in neutral tones are stylish yet inviting, polished marble tables are a fresh way of using the age-old material and metal accent pieces add a bit of edge. 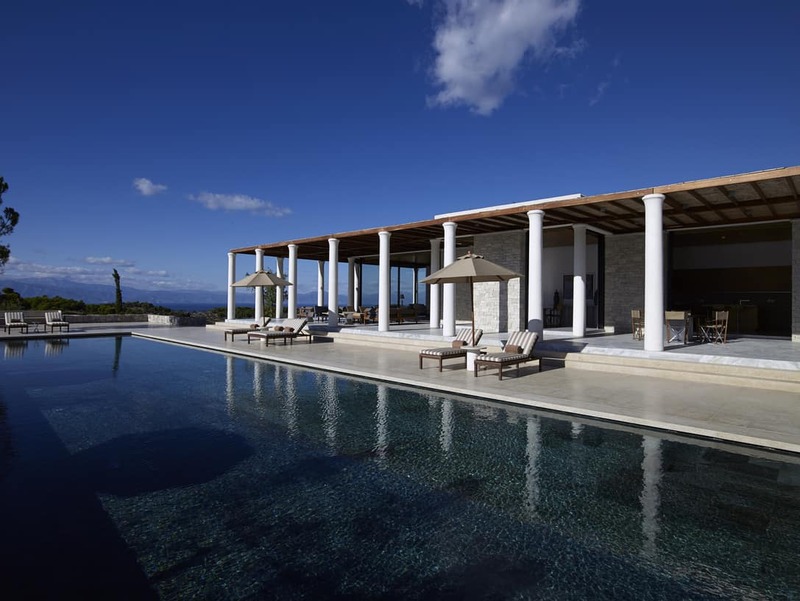 Who This Villa Is For: It is the perfect retreat for families that want to spend a vacation relaxing and enjoying the nature. 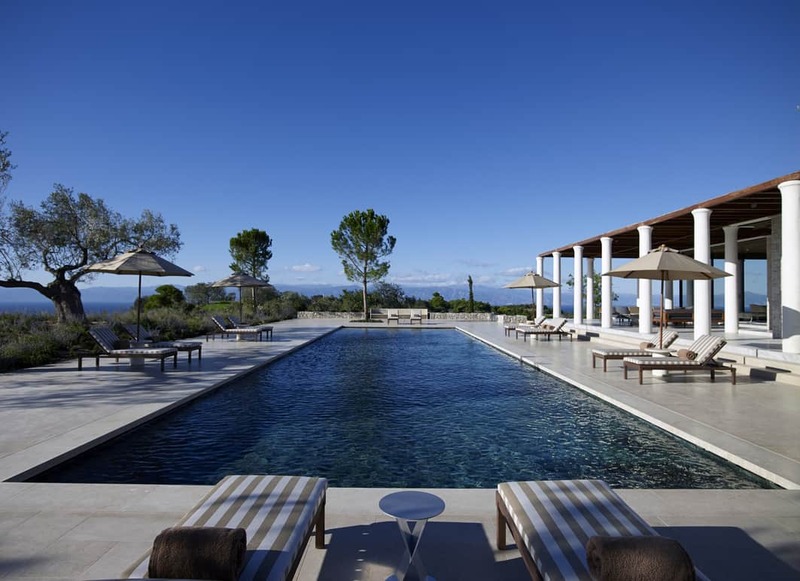 The beach club has a children pool.